It may sound unbelievable but more than one million children studying in MCD schools in the Capital have never seen their report cards for years, an issue that has now invited the ire of the Delhi High Court. Power distribution firms will have to pay hefty compensation for providing faulty services to consumers once the draft guidelines of the Delhi Electricity Regulatory Commission (DERC) come into effect. A Delhi Municipal Corporation officer who denied a citizen data on neighbourhood weekly markets has become the first official to be fined Rs 25,000 by India’s Right to Information Commissioner. As announced, former Prime Minister Vishwanath Pratap Singh could not plough the land in Bijnore on Saturday where farmers’ land is being acquired by the UP Government for a mega power project to be set up by the Reliance Group. In all, 81 persons were arrested while 27 persons were injured in the police lathi charge on Mr V. P. Singh’s supporters and farmers. The work of preparing the City Development Plan (CDP) under the ambitious Jawaharlal Lal National Urban Renewal Mission for Faridabad city began here today with an interactive meeting between officials of the Union Government, the state government and the Municipal Corporation of Faridabad (MCF), which would be implementing the plan. The national Capital experienced light showers today, relieving the people from sultry weather of the last few days and bringing down the mercury by two to three degrees celsius. Earlier in the day, clouds and a squall, blowing at a speed of nearly 30 km per hour, brought a drop in the minimum temperature in the Capital to below 28 degree Celsius, from 29.8 degree Celsius yesterday. A resident of Garh Mukteshwar has palmed off the land of his real brother by making fake documents. When the owner came to know of this and protested, the seller threatened to kill him. Many art galleries in the National Capital Territory of Delhi and across the country are preparing to showcase the works of the legendary artist, Raja Ravi Varma, whose 100th death anniversary falls this year. One of the better-known Indian artists, Raja Ravi Varma’s creations are part of many an international collection and have fetched enormous amounts in international art auctions. Contracts to the tune of Rs 2.08 crore have been awarded to advertisers on railway sites in the national Capital for the period 2005-06 by a Northern Railway officer in flagrant violation of rules and policies. The fourth cutoff list for admissions to various undergraduate courses of the University of Delhi has brought little comfort for those who were expecting the prerequisite marks to drop considerably. A man who lost sight in one eye because of a city hospital’s inability to activate emergency power supply during two successive blackouts in the middle of a cataract surgery was awarded over Rs 1 lakh in compensation by a consumer court here. The body of a youth was found hanging from a tree in Modinagar under the Sans police station area on Saturday. Two persons died and two others were critically injured when a Santro car had a head-on collision with a DTC bus this afternoon. The accident took place at 12.45 pm near Ghevra Morh, Rohtak Road, in the Nangloi area. Fresh and juicy fest of 'King' of fruits. A Division Bench of Acting Chief Justice Vijender Jain and Mr Justice Kailash Ghambhir has asked the MCD Commissioner to file a status report on the matter within four weeks and posted the matter for further hearing to August 23. The Bench also asked the Commissioner to list out in the report the various steps initiated by the MCD to improve the infrastructure in the 1,854 schools run by the corporation. The directions followed a public interest litigation, filed by a lawyer’s forum, Social Jurist, which complained about the alleged strange fact of the MCD schools having never issued any report cards to the over one million students studying in the institutions. The fact of students not being issued the basic report cards to acknowledge their performance came to light during a recent inspection conducted by the organisation to study the infrastructure available in these schools. The fact that report cards were never issued all these years defied logic and showed lack of basic concern of the authorities in promoting literacy in the country, counsel for the forum complained. Denial of report cards, the petition argued, would only demoralise the children from attending schools as neither would talent be recognized nor would there be any records to assess their performance. According to the PIL, the standard of education in the MCD schools in so bad that 80 per cent of the students passing out of class V do not know how to write or even read their own names. The PIL complained that though a number of representations were made to the authorities including the Chief Minister on the non-issuance of report cards yet no response had been received so far. Hence the petition urged the court to issue directions to the authorities to introduce the system of issuing report cards to students in MCD schools, besides improving the infrastructure at these institutions. The move assumes significance as resident welfare associations have been complaining about power connections and billing by the discoms. According to the draft, “Delhi Electricity Supply Code and Performance Standards Regulation, 2005,” discoms will be made liable to pay fines for deficiency of service just like consumers have to cough up penalties in case they do not pay bills in time. If the discoms fail to provide connection to an applicant within a specified time, they will be liable to pay the applicant compensation, which will be adjusted in the first bill and, if required, in subsequent bills, according to the draft. Similarly, if consumers do not receive their first bill within four billing cycles of their connection becoming operational, the concerned company will pay compensation to them. Drafted after receiving the views of discoms, transmission companies and members of various RWAs, the guidelines will be finalised and adopted soon, DERC sources said, adding that at present they were busy with the power tariff for the national Capital, which was awaiting the Supreme Court’s nod for clearance. Since consumers often complain that their demand for testing meters, which they feel run fast, is not addressed effectively, the new standards stipulate that companies must test such meters in 15 days or pay a daily fine. The officer, Mr S. C. Kohli, who till a few weeks ago was Shahdara Deputy Commissioner, South Zone, has since been transferred as Secretary to Commissioner Ashok Kumar, officials said. The position is currently occupied by Mr J. P. Agrawal. While designated as Public Information Officer, Mr Kohli was requested by Pandav Nagar resident Ajay Kumar Goel for data on makeshift weekly markets and the revenue they generated. Driving his father to a neighbourhood clinic for emergency treatment about a year ago, Goel found that makeshift shops hampered vehicle movement and access. He discovered a high court order against allowing such weekly markets in residential areas and queried municipal officials in the matter. According to Chief Information Commissioner Wajahat Habibullah, Mr Goel raised five points. He heard on two from the PIO, but on the remaining three “there was no response.” The CIC’s order indicates that evasive responses by PIOs are inadequate and won’t do. “The PIO did mention that the removal of weekly bazaars being a policy matter could not be decided at the zonal level,” the order noted but pointed out that the appellant had sought information— not action. If the information is not with that public authority, he should have referred it to the requisite public authority under Section 6 (3) (ii) within five days of getting the appeal. Earlier, addressing a large gathering at his official residence in New Delhi, Mr V.P. Singh said his struggle was against the loot being committed in the name of the power project in Dadri. “UP has a government of capitalists”, he said. He added Mr Mulayam Singh Yadav could not make him go back by employing force. “It is only the beginning of our struggle”, he said. At UP Gate, the state police stopped the former Prime Minister and film star Raj Babbar, MP, last noon. But a large police force and officials’ opposition could not lessen Mr V. P. Singh’s determination to reach the project venue. The former Prime Minister stayed on in his car for more than two hours. This resulted in a jam at the Ghazipur flyover. But it took a lot of persuasion and cajoling on the part of the UP Government officers to make the former Prime Minister change his mind. Mr V. P. Singh was set free late at 11.15 pm. Mr V. P. Singh’s entourage had started from Delhi at 12 noon for Bijnore Khurd to support the farmers’ cause. As ex-PM and matinee idol Raj Babbar reached UP Gate at 2. 30 pm their convoy was stopped at the barriers especially put up by the police force mustered from all over west UP police stations. Bureaucrats led by the Divisional Commissioner, Meerut, the District Magistrate, and the Director-General, UP Police, were seen pleading with Mr V. P. Singh and Mr Raj Babbar to turn back. As the supporters tried to remove the barrier, the police foiled their attempts to go ahead along with the former PM. As the leaders did not agree, they were taken into custody at 12.40 pm under Section 151. An angry Raj Babbar was seen coming out of his car and accusing the police of following the tactics of British rulers in crushing the agitation of the farmers. “The Mulayam Singh government is trying to crush the farmers by siding with the capitalists”, he said. “The manner in which the police opened fire on farmers was the height of cruelty”, he added. The DGP, however, denied that the police had fired on the farmers. Later, both Mr V. P. Singh and Mr Raj Babbar came out of their car and sat in the middle of the road. After a lot of pleading by the police and administrative officers, the two agreed to go to Vasundhra guest house where they were detained till 11.15 pm. Despite Mr V. P. Singh’s blood pressure falling rather alarmingly, the former Prime Minister insisted on going to Bijnore to keep his date with Dadri farmers. An angry Raj Babbar thundered, “We know the tactics of guerrilla warfare too”. Infrastructure advisor and consultancy agency, CRISIL, has been asked to prepare and submit the CDP within a month’s period. The final plan is likely to be submitted and approved by the government by August-end. It was organised by the MCF. More than Rs 2000 crore was likely to be sanctioned under the scheme. The Commissioner, MCF, told the officials that the project would be focusing mainly on the urban infrastructure and governance besides the basic services to the urban poor, especially those living in slum areas. He said while the MoU for the project was likely to be signed very soon a state-level steering committee had already been constituted under the chairmanship of the Chief Minister. He said the CDP would be prepared by M/s CRISIL Ltd, which had agreed to submit the report by August 15. Mr. Ravi Poddar, Head, Business Development, CRISIL, claimed that the work would be completed within the given timeframe, provided that the relevant details and data were supplied immediately. He said the JNURM project was meant for about 63 cities of the country, which had a population of more than 10 lakh. Faridabad was the only city of Haryana to be included in it. He claimed the authorities concerned would have to implement mandatory as well the optional reforms for effective results and handling the problems relating to the scheme. About 50 per cent of the total budgetary funds would be made available by the Union Government. The state government would have to ensure at least 20 per cent of the financial contribution of the total costs. The remaining 30 per cent would be generated by the MCF from its own resources. According to experts, the implementing agency had to ensure that the process and system of revenue collection for services, including house tax and other user charges, was efficient and hurdle-free. If the project was to be a success, sustainability had to be of primary importance. The JNURM was to be implemented between the period of 2006- 2011 and it was expected to create a broad-based civic infrastructure for the requirement of the year 2035, stated the officials. It was announced that various stakeholders, including representatives of residents and resident welfare associations, would be taken into confidence for getting details for preparing the CDP. It may be recalled that the development plan of Faridabad has 91 urban sectors, 41 revenue villages, with the population projected to be around 17. 5 lakh in the year 2011. With more than 45 per cent of the population residing in unauthorised colonies and slum areas, the city has an area of 208 sq km for cleaning and scavenging, 450 km of sewer lines, 550 km of water supply lines, 420 tubewells, 1118 km of metalled roads, 73 approved colonies, several unapproved colonies, more than 22,000 streetlight points and as many as 24 fully developed sectors. The national Capital experienced light showers today, relieving the people from sultry weather of the last few days and bringing down the mercury by two to three degrees celsius. Earlier in the day, clouds and a squall, blowing at a speed of nearly 30 km per hour, brought a drop in the minimum temperature in the Capital to below 28 degree Celsius, from 29.8 degree Celsius yesterday. The Met Office has predicted light to heavy showers accompanied by thundershowers during the day as well as tomorrow. The Met Office said the turnaround in weather conditions since yesterday could also be due to a fresh upper air cyclonic storm originating in North Pakistan and Jammu and Kashmir. 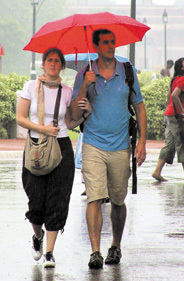 They have forecast more such squalls and rain in the Capital during the next few days. The victim of the fraud has filed a case naming his brother and four other persons. The police are investigating. Nanak Chand, son of Ram Prasad, resident of Mohalla Khatikan under Kotwali, has filed a case that he is the owner of land vide Khasra no 290, and Khasra no 374 in Garh Bhangr and the land continues to be in his possession. On June 7, his brother, Charan Singh, sold his part of the land to Kunti, wife of Jagdish, through a fictitious “benama”. Charan Singh, masquerading as Nanak, put his photo in the sale document with Hari Ram and Pale, wife of Saroop, as witnesses and sold the land of his brother Nanak. Nanak has now filed a case against his brother Charan Singh, naming Hari Ram and Kunti as witnesses. The police, who are investigating the matter, have arrested the accused. Many art galleries in the National Capital Territory of Delhi and across the country are preparing to showcase the works of the legendary artist, Raja Ravi Varma, whose 100th death anniversary falls this year. One of the better-known Indian artists, Raja Ravi Varma’s creations are part of many an international collection and have fetched enormous amounts in international art auctions. Raja Ravi Varma was born on April 29, 1848, at Kilimanoor, a small town in Kerala. As a young boy of five, he is said to have covered the walls of his house with pictures of animals and illustrations from everyday life. His uncle, the artist Raja Raja Varma, spotted the talent and started giving him elementary art lessons. He was taken to Thiruvananthapuram in his fourteenth year to stay in the royal palace and learn the intricacies and subtleties of oil painting. During these formative years, the young Ravi Varma had many opportunities to discover and learn new techniques and media in the field of painting. His later years, spent in Mysore, Baroda and other parts of the country, enabled him to hone his skills further and blossom into a mature and complete painter. According to critics, the glittering career of Raja Ravi Varma “is a striking case study of academic art in India”. In the year following his death, “Modern Review” described him as the greatest artist of modern India, a national builder who showed the moral courage of a gifted ‘high-born’ in taking up the ‘degrading profession of painting’. He was courted assiduously by the British Empire as well as by the Indian Maharajas. His less expensive prints of the Hindu deities hung in almost every home. 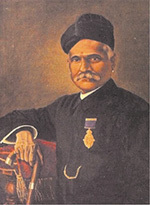 Critics claim that Raja Ravi Varma owed his success to a systematic training, first in the traditional art of Thanjavoor, and then in European art. His paintings can be broadly classified into portraits, portrait-based compositions and theatrical compositions based on myths and legends. Though the artist’s immense popularity lay in the theatrical compositions based on myths and legends, the first two types of works prove his merit as an exceedingly sensitive and competent artist who successfully exploited light and shade for emphasis. Ravi Varma is considered as modern among traditionalists and a rationalist among moderns. According to art critics, “He provided a vital link between the traditional Indian art and the contemporary, between the Thanjavoor School and Western Academic Realism”. He brought Indian painting to the attention of the larger world. Raja Ravi Varma breathed his last on October 2, 1906, leaving behind a rich legacy of art. For those who are interested in Persian poetry at its best, the Iranian Culture House on Tilak Marg here should be the place on July 12 evening. of the internationally acclaimed Persian poet, Firdosi. The discussion will focus on Zuhak Mar Dosh, one of the stories in Firdosi’s Shahnama. The Habitat Film Club and the Film and Television Institute of India (FTII) released a DVD, Master Strokes, a collection of the best first films of established masters and rising stars of the industry at a function held in Gulmohar Hall on Saturday. The contracts were awarded flouting well-laid policies and norms. It has been done without inviting tenders. The policy guidelines, issued on October 5, 2004, by the Railway Board, states that “”Concurrence of FA&CAO and approval of GM is needed for publicity work to be awarded on first come-first serve basis, without an open tender”. Twenty contracts for railway sites were awarded between August 1, 2005, and October 31, 2005, without an open tender taking recourse to the policy of first come-first serve. The policy was evolved and finalised for promoting new ideas and concepts. But in awarding these contracts, instead of new ideas and concepts, what is being displayed at 20 sites in Defence Colony, Shadipur, Sarai Rohilla, Bhogal bridge, P K Road, Safdarjung, Basant lane, Jail Road, Sriniwaspuri, Ashram flyover, Janak Setu, School Lane and near Millenium Park are not even electronic displays as being stated in the contract. They are simple hoardings on huge iron structures which pose a hazard to human life..
On an inspection of these 17 locales, this correspondent found that regular and ordinary hoardings have been put up and no where electronic display advertisements have been installed. New ideas or concepts could not be discovered on any of the sites or on any of the hoarding. Not only that, the allotment letters have been issued to advertising agencies without taking concurrence of FA but even an approval from the GM, Northern Railway, is missing, sources said, adding that the Railways could have earned much more from these sites if normal route of allotment of these sites through tenders had been followed. Misdeeds of allotment have been cleverly camouflaged by charging the rate arrived at open tender process for side panels. Whereas what has been allotted are front panels. Going by trade circles information, the rate for front panels is normally double the rate of side panels, resulting in loss of revenue to the Railways. . The story of manipulation of guidelines does not stop here. Advertisements can officially be put up only after issuance of allotment letter and subsequent fixing up of “mean commencing date”. “Mean commencing date” denotes the starting date from where the period of contract-whether one , two or three years is to be calculated. For example, the acceptance letter for Sarai Rohilla and Bhogal flyovers were issued on October 20, 2005, and no allotment letter has been issued to them till date. But the hoardings have been merrily put up by the advertisers. Knowledgeable sources in the advertising world said that such hoardings as have been installed at these sites cost Rs 2 lakh per month. It could be anybody’s guess as where this amount, which in normal course would have gone to the Railways, is going. A contractor, thus, earns about Rs 5 lakh. Such irregularities do not normally take place without the tacit consent of the officer concerned, sources pointed out. All these contracts have been awarded by the Senior DCM of Northern Railway and his seniors have been bypassed, officials pointed out. The said officer’s clout can be judged by the very fact that he has been in Delhi for the last 13 years when no officer of the Indian Railways is allowed to stay in one place for more than 10 years. Sources said that the officer has a direct access to Railway Minister Laloo Prasad Yadav and often enough he plays the role of a Man Friday for the minister as was evident at the recent wedding ceremonies and wedding reception of the minister’s daughter. undergraduate courses of the University of Delhi has brought little comfort for those who were expecting the prerequisite marks to drop considerably. While admissions to popular courses and colleges were almost over after the declaration of the second list, even the evening shift colleges have been able to close admissions this year. Admissions are available in some programmes under the Science Department. In ARSD College and Dyal Singh College admissions are closed for the major streams, barring Hindi Hons, which has a cutoff of 55 per cent and 53-67 per cent, respectively. In Aditi Mahavidyalaya the cutoff for BA programme is 58 and admission is over for other streams. In Delhi College of Arts and Commerce the cutoff for B.Com is 84-89, in Deshbandhu the cutoff for BA is 64 per cent and 61-63 for Political Science Hons. In Ram Lal Anand (E) College the cutoff for BA is 59 per cent and for Economics Hons it is 70 per cent. Inn Satyawati Evening the cutoff for BA has come down to 58-62 and for B.Com to 74.25-76.25. The cut off for Physics Hons is 77 in ANDC, 71 in Deen Dayal Upadhyaya College and 69.66 in Deshbandhu. The cutoff for Chemistry Hons is 66 in ANDC, 70 in ARSD, 67 in Deshbandhu, 80 in Hindu and 68 in Rajdhani. In Ramjas the cutoff percentage for Physics Hons is 81, for Chemistry admission is closed and 71 per cent for Botany Hons. Admissions in most colleges are already over for B.Sc in Physical, Life and Applied Sciences. The cutoff list will be displayed by different colleges of the university on Monday, July 10, 2006. Candidates have been advised to contact the respective colleges on Monday, July 10, for admission related formalities. “It had taken about 15-20 minutes of crucial and precious time for the restoration of power supply, which clearly reflected the lack of basic infrastructural facilities necessary for the hospital,” observed the Consumer Disputes Redressal Forum (North) headed by president K. K. Chopra. The court has ordered both Shyam Lal Eye Hospital at Malka Ganj here and National Insurance Co Ltd, both parties to the complaint, to jointly or separately pay victim Shanker Lal of Kartar Nagar Rs 1lakh in damages. It has also ordered the hospital to pay Rs 10,000 for causing mental agony and harassment to the complainant. The father of the deceased is an officer in the Income Tax Department. While the family insists it is a murder, the police are treating it as a case of suicide. The police were informed about the body of a youth hanging from a tree in Hanumanpuri near a drain yesterday. The police found a letter from the victims’s pocket, saying, “I am committing suicide due to my father”. While the police are taking it is a suicide, the family insists he was killed and later hung from the tree. His uncle, a Delhi police constable, Yogesh Kumar, said the youth had gone to Sultapuri in Delhi along with his aunt and had been missing since the same evening. Police officials said that the car and the DTC bus were both being driven at high speed. The deceased have been identified as Rajan (44) and Dharampal (36). Both were sitting on the front seat of the car, the police said. The injured have been identified as Rakesh (24) and Raju (28).